How to view the Calendar in the Dashboard on Connect. From the dashboard you can see the Calendar, which shows the move in and move out dates of clients within a site. 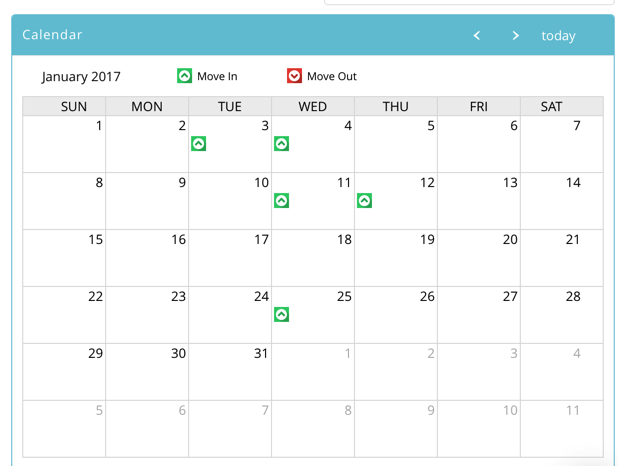 Move in dates are represented by a green upward pointing arrow, move out dates are represented by a red downward pointing arrow. By clicking on these arrows you can see the names of the clients moving in and out on these days. These will appear in a new window and will give Client name, Status, Office, start and end dates and their billing reference. A link to the Clients page is also found here. You can scroll through the months using the forwards and backwards arrows at the top, and return to today’s date by clicking Today.